OVERVIEW These frogs are considered one of Earth's most toxic, or poisonous, species. For example, the golden poison dart frog has enough poison to kill 20,000 mice. With a range of bright colors—yellows, oranges, reds, greens, blues—they aren't just big show-offs either. Those colorful designs tell potential predators, "I'm toxic. Don't eat me." Scientists think that poison dart frogs get their toxicity from some of the insects they eat. How do poison dart frogs capture their prey? Slurp! With a long, sticky tongue that darts out and zaps the unsuspecting bug! The frogs eat many kinds of small insects, including fruit flies, ants, termites, young crickets, and tiny beetles, which are the ones scientists think may be responsible for the frogs' toxicity. Poison dart frogs live in the rain forests of Central and South America. 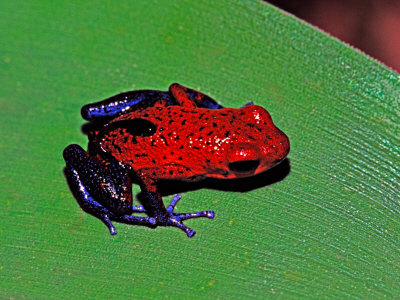 Description: Vibrant but toxic, poison arrow frogs range from less than an inch to two and a half inches in body length. There are more than 100 species of poison dart frogs, varying in color and pattern. The black and green species has black spots, the strawberry or blue jeans frog is all red with blue legs, the yellow-banded species appears painted with yellow and black. Color shades vary among frogs within a species. It is the skin that contains the frog's poison. These beautiful colors are warnings to potential predators that the frogs are poisonous. Other species, such as monarch butterflies, sport bright colors to advertise their toxicity. Several species of non-poisonous frogs evolved with similar coloring to avoid being eaten. Some scientists think that the reticulated pattern of the frogs also acts as camouflage among the forest shadows. Distribution and Habitat: Poison dart frogs live in the rainforests of Central and South America and on a few Hawaiian islands. Diet in the Wild: Poison dart frogs feed mostly on spiders and small insects such as ants and termites, which they find on the forest floor using their excellent vision. They capture their prey by using their long sticky tongues. Zoo Diet: They are fed small crickets daily. Reproduction: Male frogs go through an elaborate ritual to attract a mate. The males vocalize, a loud trill sound, to attract females. Once the courtship ritual is complete, the females deposit dozens of eggs on leaves. The eggs are encased in a gelatinous substance for protection against decay. During the two-week development period, the male returns to the eggs periodically to check on them. Once the tadpoles hatch, they swim onto the male’s back and are attached by a mucus secretion, which keeps them from falling off. The male carries them to a place suitable for further development, such as wet holes in broken trees and branches, little ponds, wet coconut shells, and even in tin cans and car tires. Tiny pools of water that collect in bromeliads are also used by some species. Once at their final destination, the tadpoles are on their own. They need an additional three months to metamorphose into small frogs. Life Span: They may live more than ten years in captivity. Status: Some poison dart frogs are endangered due to habitat loss, which is causing numbers to decline among many species. The possibility of new medications from these frogs' secretions is being explored. Fun Facts: Poison dart frogs, also called poison arrow frogs, are so named because some Amerindian tribes have used their secretions to poison their darts. Not all arrow frogs are deadly, and only three species are very dangerous to humans. The most deadly species to humans is the golden poison arrow frog (Phyllobates terribilis). Its poison, batrachotoxin, can kill many small animals or humans. These frogs are found in Colombia along the western slopes of the Andes. Arrow frogs are not poisonous in captivity. Scientists believe that these frogs gain their poison from a specific arthropod and other insects that they eat in the wild. These insects most likely acquire the poison from their plant diet. In 1999 a Zoo pathologist published his discovery of a then-mysterious infection that was afflicting and eventually killing poison arrow frogs and white’s tree frogs. Through his effort, cutaneous chytridiomycosis was documented for the first time as a vertebrate parasite. The veterinarians along with keepers and pathologists also developed a treatment for the chytrids. The same antifungal that is used to kill athletes’ foot in humans can be used with the frogs and toads. POISON DART FROG Poison Dart frogs live in rainforest habitats in Central and South America. They can be found in trees, as well as under leaves and logs and rocks on the floor of the forest. Because of their size, from ½ to 2 inches long, they are hard to see. Poison frogs warn predators with brilliant colors and patterns. There are many species of poison frogs that can be found in every color under the sun! They prey on invertebrates, especially certain ant species, which build up really strong poisons in the frog. Dart Frogs got their name because hunters would tip their arrows in the frog’s poisons. Sadly, because people are cutting down rainforests for farming and ranching, Poison Dart Frogs are at risk. 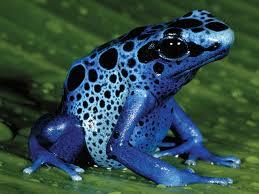 The Blue Poison Dart Frog is the most endangered due to the pet-shop market. Poison Dart Frogs will eat termites, crickets, flies and ants. about 12 days to hatch.